I am LOVING my new grill press! We are making all kinds of new sandwiches for lunch on the weekend. This sandwich happens to be our favorite sandwich from Roly Poly. It is #52 on the menu - the Hickory Chicken. Roly Poly describes it as "Sliced Chicken Breast, Melted Cheddar Cheese, Onions, Mushrooms, Bacon, BarBQ Sauce, Grilled Golden Brown with a Side of Ranch Dressing". We both love it. I get it without mushrooms and onions (of course). Chicken Legs will eat it all the way or without onions. I used my favorite grilled chicken tenders and assembled it as described. It turned out much better than the original. I think the chicken made the most difference. I also used my favorite whole wheat tortilla. I already have some chicken marinating in the fridge to try more of our favorite Roly Poly sandwiches this coming weekend. Lay the tortilla on a flat surface. Layer ingredients in order on tortilla starting with cheese and ending with mushrooms. Roll up the sides of the tortilla and place in grill pan. Top tortilla with grill press and grill until golden brown. Turn over and brown the other side. Serve with a side of Ranch dressing. Oh yea, I can see why that's a favorite! Looks and sounds great. I like all the ingredients in this recipe. I LOVE Roly Poly, but there's not one anywhere around where I live. :( I once saved a menu to give me some sandwich ideas, but I have since lost it. 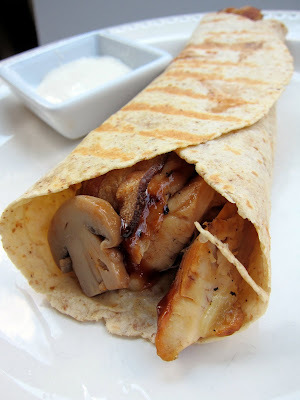 This wrap looks yummy! We used to have a Roly Poly here but they closed years ago. I thought they were a stand alone store, didn't realize that they were a chain. I loved that place. These look good, Steph. I hadn't thought of using our press like that. Great idea. Enjoyed these! I used my George Foreman to press the wraps for 1 minute and it worked beautifully. I just used plain grilled chicken with some salt and pepper this time, but next time I think I'll do a quick marinade with the Lawry's Buffalo BBQ 30-minute marinade.